LureMaking.com's Heat and Dip Powder Paint is simply amazing!!! 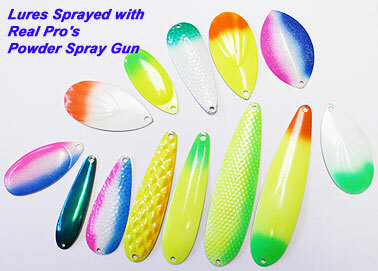 Just heat your lure over a smokeless candle flame, propane torch or in a toaster oven and dip it into the powder paint. Remove and watch the paint melt onto your lure. It's that simple! For maximum durability, hang part in the oven for 10 to 15 minutes at 350�F (180�C) to cure to a rock hard chip proof finish. Lures with weed guards should be cured at 250�F for 25 minutes. The lure is painted and dry in just a moment. No primer; no base coat; one coat complete coverage! HIGH GLOSS FINISH IN ONE COAT. Available in 50g and 1lb (454g) sizes. We now stock 74 colours and finishes of powder paint. DOWNLOAD INSTRUCTIONS HERE (75k pdf). A 50g Jar will paint approximately 450 3/8oz jig heads. 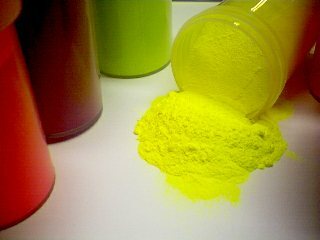 Our Heat and Dip Powder Paint is non-flammable and may be exported and shipped by air. A 50g jar will coat approximately 450 3/8 oz ball jig heads. Easy to create amazing effects using the Powder Paint Air Brush.